Federal courts have repeatedly held, to the point that it can probably be considered settled law, that the First Amendment gives people commenting on the Internet the right, albeit a limited one, to anonymity. The reasoning is that anonymity allows a person to express views without fear of reprisals by people who disagree, and that for the government to compel an anonymous commenter would have a chilling effect on speech, thereby violating their First Amendment rights. But what happens when an “anonymous” poster on the Internet says something that might be legally actionable, such as defamation or fraud? 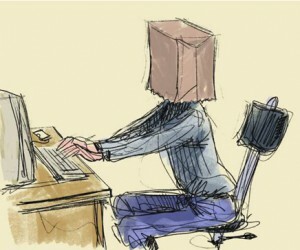 The issue of the constitutional right to Internet anonymity usually comes up when someone wants to sue an anonymous speaker for defamation. Here’s how the procedure usually goes: on a website blog, or blog comment, an anonymous poster says something that might be grounds for a lawsuit – usually it’s something defamatory about someone else. The subject of that statement hears about it somehow, and decides they want to sue whoever wrote the comment. Of course, you can’t sue someone if you don’t know who they are. So, the plaintiff will file a lawsuit against the person who wrote the defamatory statement, naming the speaker as an anonymous or “Doe” defendant (the plaintiff will be identified as “John Doe” until their identity can be ascertained). Once the lawsuit is filed, they will then serve the relevant website or Internet service provider (ISP) with a subpoena, demanding that they reveal the identity of the person who made the anonymous post. At that point, the major constitutional issue is whether or not the court should enforce that subpoena. The Electronic Frontier Foundation (via the Volokh Conspiracy) has a good analysis of the basics of this issue. Basically, if you want to sue an anonymous poster for defamation, you have a few initial hurdles you must first clear. The biggest one is convincing a court that your rights, which were allegedly violated by the speaker’s words, outweigh the speaker’s First Amendment right to speak anonymously. However, a federal court has recently thrown something of a wrench into this doctrine, holding that the privacy protections that apply to defendants in cases brought by private litigants do not apply to lawsuits brought by the federal government. In this case, the SEC brought a lawsuit against the owner of an anonymous email address, which the government alleged was being used to promote certain stocks in an illegal “pump and dump” scheme. While I certainly don’t condone fraudulent manipulation of stock prices, I find this ruling somewhat disturbing. Even if the result is appropriate, the means by which the court arrived at it are unsettling. In other words, I think that this person was engaging in illegal and immoral activities, and his identity should have been unmasked. However, I don’t think the court should have dispensed with the test that balances the interests of the parties. This sets what I believe to be a dangerous precedent, in which the government can unmask an anonymous writer without more than a suspicion that their writings might be unlawful. While the guy who was fraudulently manipulating stock prices certainly deserves whatever punishment he got, the next person subject to this power might not be so clearly guilty. For example, what if the government wants to unmask the identity of someone who writes under a pseudonym, and touts extreme and unpopular political views, which the government believes might lead to violence, even though the speaker never advocates violence? While there may certainly be a governmental interest in keeping an eye on such a person, there is no question that they have a right to express their views, no matter how strange or extreme those views may be. If speakers know that their identity can be easily unmasked, they may well decide that they shouldn’t take the risk of expressing their views online, which definitely isn’t what free speech is about. This story is also an object lesson to ordinary internet users, and it’s something we’ve known since Al Gore invented the Internet: anonymity online is 100% illusory. There is basically no such thing as “anonymous” speech on the Internet. I’m not praising or criticizing that fact – I’m just saying that, by the Internet’s very nature and architecture, it’s impossible to be completely anonymous online. So, if you are about to make a “brilliant” comment on a YouTube video, here’s some advice: before you click “post” ask yourself if you would want everyone in the world knowing the name of the person behind your online handle. If not, maybe it’s best to keep your thoughts to yourself. I’m not saying you shouldn’t express opinions. All I’m saying is that, in the modern world, you should never assume that you are truly anonymous, because you probably aren’t.